Dr Carly Golodets, originally from Perth, gave an interesting address on Conservation, Climate Change and Cattle Grazing in Israel. 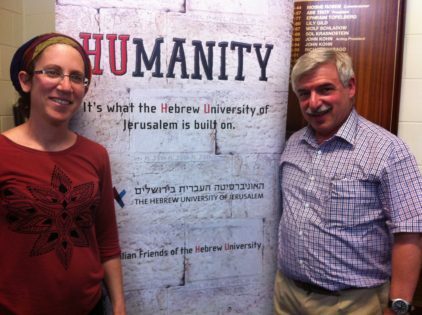 Carly addressed a fascinated audience at the Perth Jewish Centre on 23rd of February. In her talk she gave some insight into the labour involved in ecological research, and the meticulous note keeping and detail which she and her fellow scientists pursue in the name of science. The principle task of the research she conducted, while completing her PhD at the Hebrew University of Jerusalem, was to establish the effect of animal grazing on the ecosystem in Israel. Raising goats has been carried out for thousands of years and it became evident from her talk that this activity is crucial for plant renewal and the survival of the ecosystem in Israel. She pointed out that the Australian ecosystem is very different from that in Israel, as goats, which are an introduced species in Australia serve no ecofriendly role at all. “Climate change is here and the extremes of weather that we have experienced have also been experienced in Israel” said Dr Golodets. At the completion of her address she answered numerous questions from the audience, especially relating to her earlier work on forests in the south west of WA.